Tocasaid: Sow good. The championship season. Sow good. The championship season. It's been a belter. Obviously for those of us who watch the fitba through maroon-tinted goggles it was unexpectedly painless, at least in the league. The cups were another story but if Robbie Neilson's plan was to concentrate on the league then it worked a treat. The three-horse race with Hearts, The Rangers #2 and Hibernian didn't work out. Instead, Hearts had the league sown up before Valentine's Day with Falkirk and Queen of the South in particular forming a cluster of four some distance behind. I was lucky enough to be at the Whisky Fringe when news of Sow's last minute winner at Ibrox came through. Probably the most important goal of the season. It instantly dented the unfounded and undeserved self-regard of Sevco Rangers and their lapdogs in the media. From that game on, they were trailing Hearts and proceeded to go to pieces. That was followed up by another important defeat of Hibernian who after the previous season's farce hadn't really got going yet. High-score of the season is an easy one to call. Again, an important win came when Da Rangers were labouring to draws with Falkirk and er... Cowedenbeath the week following this mauling. In March, Stuart McCall who had done a grand job leading Motherwell into danger took over at the Ship of Fools and went on an unbeaten run. Or in other words, a series of draws against teams in the second tier of football whose player budgets would barely stretch to buying a pair of spades for both of Rangers' gardening-leave managers. Hibs meanwhile were looking good and were now the closest of 'the other two' to Hearts. When they met Rangers at Easter Road on March 22 anything other than a Hibs win would give Hearts the title. As per usual in games of high significance, Hibs went to pieces and McCall was the toast of the Blue Derry Boys of Billy Union Orange or whatever the Rangers' fans sing about themselves. When the fixtures were announced, the Hearts/ Rangers match on the final day of the season was seen by some to be the title decider. In the end, Hearts won it without kicking a ball. In the middle of March. All that were left were the play-offs. Alloa deservedly secured their Championship status while the formidable Queen of the South narrowly lost to Rangers. The idea of Da Rangers back in the top flight was as appealing to most of us as being caught in a sandwich between Eric Pickles and Jackie Baillie. Could Hibs stop them? No. Only Motherwell, who had under Stuart McCall, been sacrifical lambs for Die Rangers stood between the Premiership and the Forces of Dunkelheit. In the end, all's well that ends well. Sevco were trounced over two games and their cartoon defender Moshni is facing police action after giving Motherwell's Irwin a bit of doing after the final whistle. At least for another year, Scotland's top flight will be spared the violent play of Rangers players as well as the violence, sectarianism and racism of their fans. Some further financial woe is not out of the question. 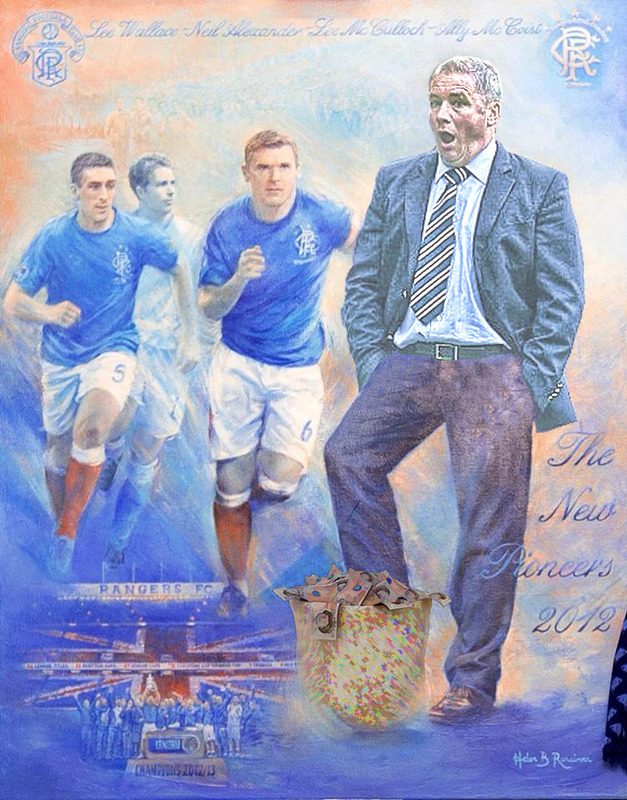 'Glib and shameless' Dave King who had a hand in the previous Rangers going bust is now at the helm. What could go wrogn?